My toddler had been the perfect sleeper… until the dreaded 2 year old sleep regression. He’d go to sleep as he usually would, but in the middle of the night, would get out of bed, run to the door, and cry hysterically until I opened the door. But my going into their room only seemed to aggravate him even more, resulting in further kicking, screaming, even slapping. Other times, bedtime would already begin with terrible tantrums, and he’d refuse to go to bed. Any attempt to get him to sleep would be met with even more kicking and screaming. This seemed so unlike him—I had never seen him so totally out of control. The worst part was that I knew he was tired. We both were. The lack of sleep didn’t help the fact that I still needed to get up the next day and go to work. If you’re reading this, you can likely relate to these sleep problems. You may be just as exhausted as I was from the lack of sleep, not to mention frustrated from these antics that seemed to happen out of nowhere. You’re wondering how long this stage is going to last (or whether it’ll ever end). 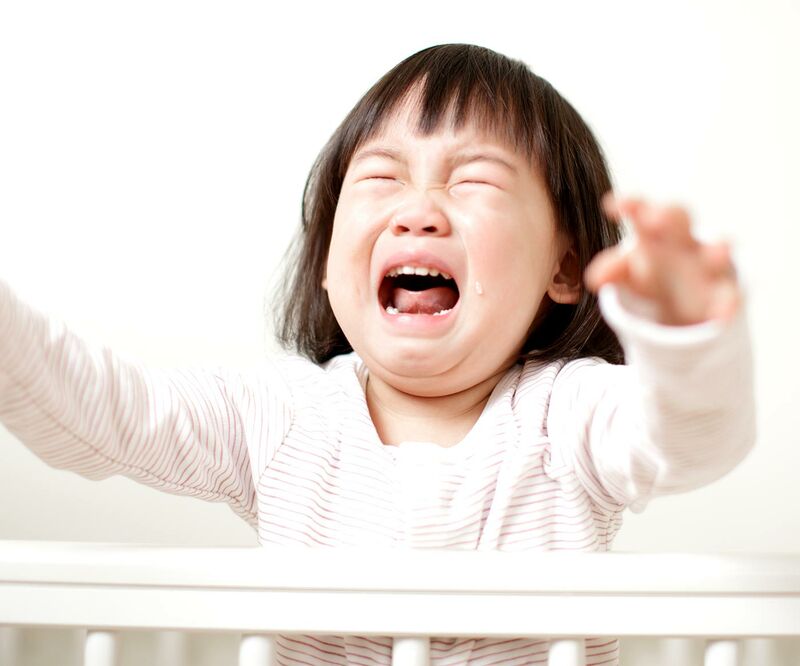 Trying to get your child to sleep in her bed fails, and even holding her or lying next to her only works until you leave the room (at which point she screams for you to come back). The only “solution” you’ve found so far is to let her sleep in your bed, just to avoid the meltdowns. More often, the 2 year old sleep regression coincides with changes in your child’s life. She may be welcoming a new baby, sleeping in a new toddler bed, or attending a new school. But other times, it can happen out of nowhere, or because of reasons you can’t easily pinpoint. For most parents, the 2 year old sleep regression will eventually end on its own, without having to do much. Trouble is, relying on letting your child sleep in your bed or acquiescing to her every demand sets up habits that can be difficult to undo. Plus, not many parents know that there are things you can do in the meantime, other than waiting it out. 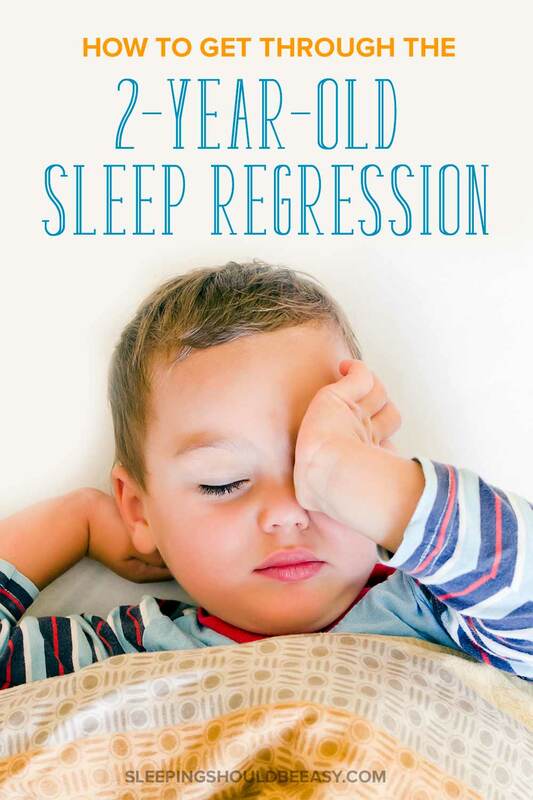 These tactics will get you out of the 2 year old sleep regression much quicker and more effectively than continuing with the patterns you may be using. The 2 year old sleep regression can often happen because of new fears. 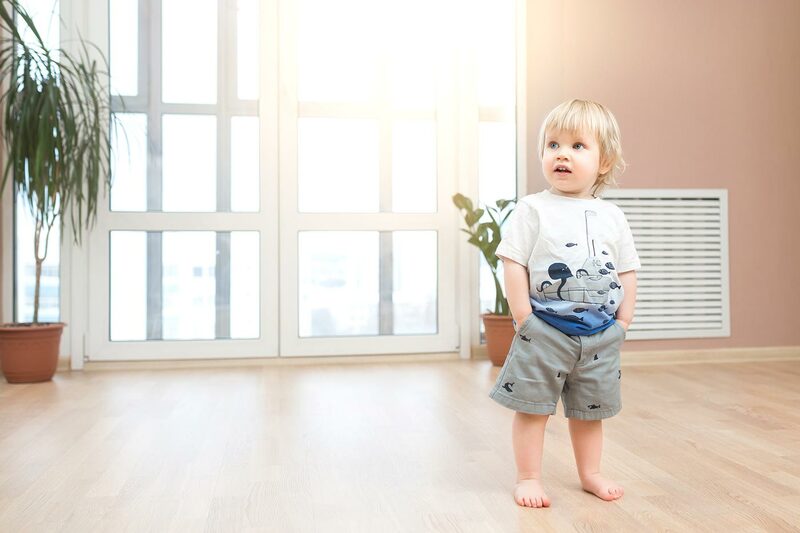 The same room combined with your child’s growing imagination could be contributing to fears he never had before. Closets seem mysterious, and the lamp that had always been there now feels foreboding. To tame these fears, “walk” around the room and point to things that are scaring him in the dark. Have him touch the base of the lamp so he knows it’s simply an object, or grab toys out of the closet so he’s reassured nothing is lurking inside. Allowing him to claim his power over these once-frightening items in the room can be just what he needs to sleep well-rested. As farfetched as it may be, your child’s behavior at night could stem from what happens during the day. This is especially true if she’s going through changes in her life, such as seeing your pregnant belly grow or adjusting to a new daycare. The night is, after all, a long stretch of time you spend apart. To you and me, we’re simply asleep and don’t see it as being separate, but to your child, this could be the dreaded part of the day when she doesn’t have you to herself. To combat these anxieties, spend quality time with her during the day, preferably alone and without distractions. Even a few minutes or pockets of time throughout the day can reassure her that you love her no matter what. When she feels “full” of your affection and attention, she’s better able to cope with difficult feelings she may have at nighttime. 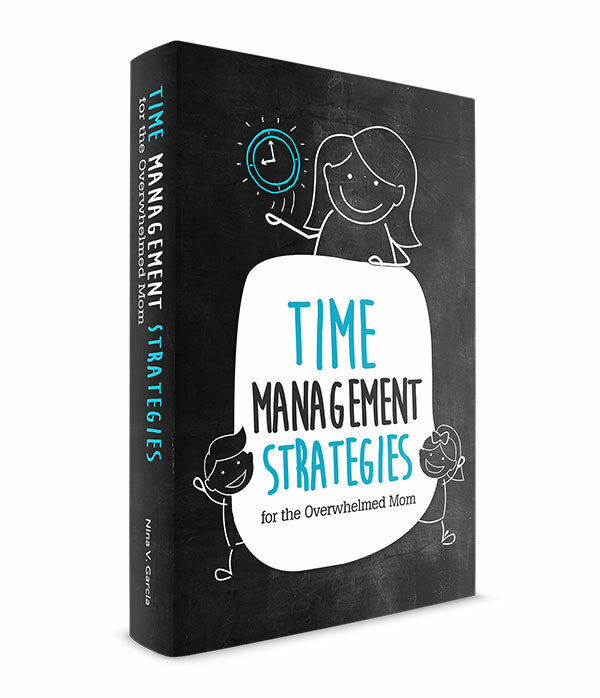 Learn how to spend time with your family—even as a busy mom. Many of us have assumed that the more tired our kids are, the more prone they are to sleep through the night. After all, how often have we conked out ourselves after an exhausting day? But for many kids, sleep begets sleep. The more tired—or even overtired your child is leading up to bedtime—the harder it can be for him to fall asleep. In fact, the 2 year old sleep regression can often be a result of him already being tired long before bedtime starts. The easiest way to experiment with sleep is to have an earlier bedtime. Have your child sleep not when he’s beyond tired, but at that comfortable place of welcomed drowsiness. You could move bedtime up as little as 15-30 minutes at a time to see if that can help him sleep well that night. 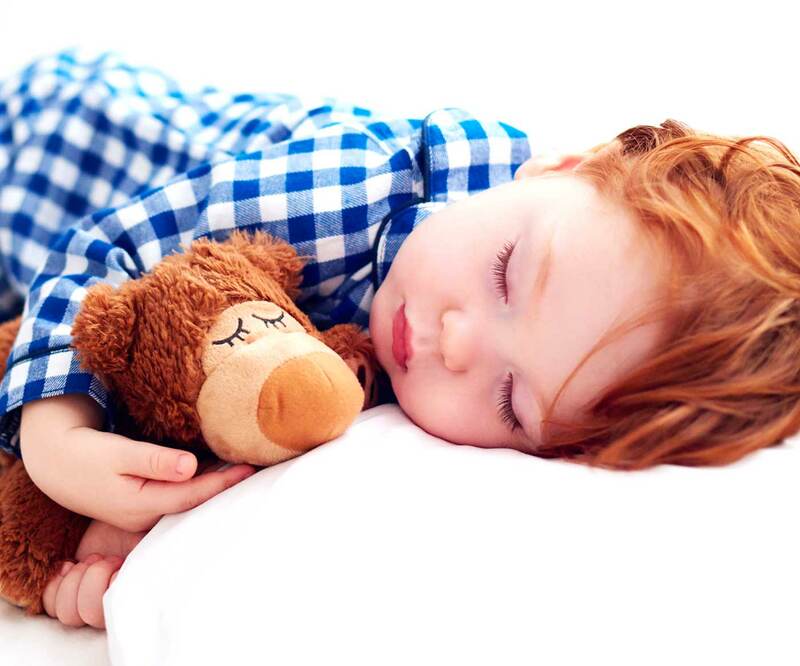 Read here to see if your toddler may be sleeping too late. I noticed that my kids and I spent a lot of time in the living room, the kitchen, even my bedroom, far more than we did in their bedroom. Their bedroom remained almost untouched… until it was time to sleep. You can imagine that this doesn’t always make the room as inviting or pleasant when we hadn’t spent a single minute in it since waking up that morning. Making your child’s room feel welcoming and “normal” can ease her fears and anxiety come nighttime. And the best way to do that is to do as much of your routine in her room. After her bath, get her dressed in the bedroom instead of the bathroom, and read bedtime books next to her bed. This can make the transition into sleep much easier since she’s already in the room, especially after having spent a few pleasant moments in there with you. Back when my husband and I were dating, he mentioned he used to have a monkey stuffed animal named Morris that he kept with him at all times. In typical cheese-style, I bought him a new monkey stuffed animal as the “new” Morris. Now that we have kids, Morris stays in fairly good condition… since we don’t let the kids play with him much. 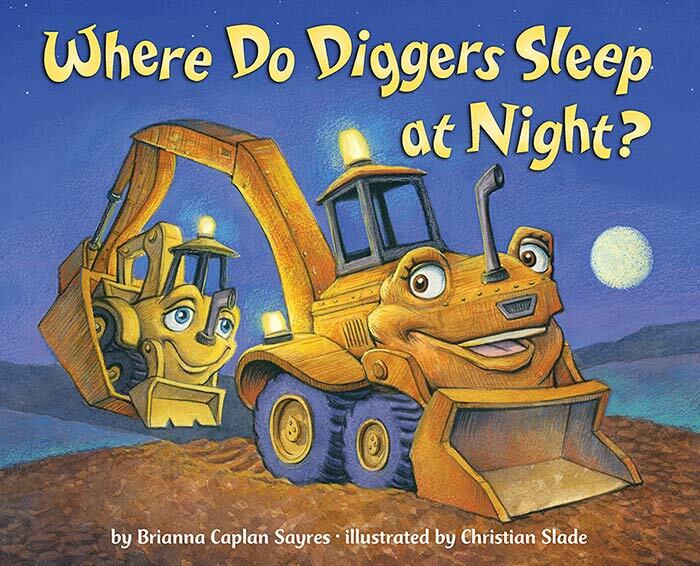 That is, unless they have a difficult time falling asleep. In fact, when my 2 year old was going through a sleep regression and even climbing out of his crib, offering Morris to sleep with—normally out of bounds for them—was enough to keep him in bed all night. Any fears that lurked didn’t stand a chance with Morris by his side. 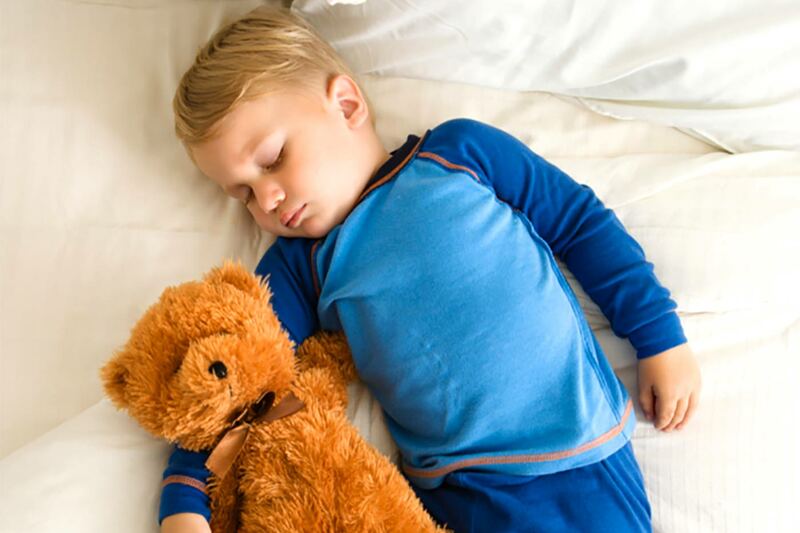 Whether a special stuffed animal, a beloved toy, or even your own pillow, give your child a special, comfort item to sleep with for a few nights. She’ll recognize the importance of being able to sleep with something out of the ordinary to get her sleeping through through the night. And join my newsletter and discover the 5 mistakes that are keeping your child from self-soothing! This PDF speaks to moms of babies but applies just as well to toddlers. Whether you’ve tried to teach your child to self-soothe in the past or are just now considering it, take a look at the 5 key mistakes to avoid. Download my resource below—at no cost to you. “Hi Nina! My two boys are now just 4 and 2 and I swear everything you write about I have experienced! Such a comfort to know all of this is normal. Thanks for all you write. It’s really uplifting and gives me hope that it will all be fine! -Margaret B.
You’ve likely noticed that inviting your child to sleep in your bed isn’t exactly going to end on its own. It’s time to encourage her to sleep in her own bed—and stay there. Giving in to the tantrums may mean a quick solution for the night, but months of bad habits down the line. Yes, she’ll likely get upset, but catering to her tears means not doing what’s truly in her best interest: reassuring her that she can sleep on her own. Reassure her throughout the night with frequent and timed check-ins so she knows you’re still here. But keep things subdued and matter-of-fact. Don’t give in to long talks, negotiations, or even hours of holding her in your arms. Simply walk her back to bed, calmly and confidently so she knows everything is fine. 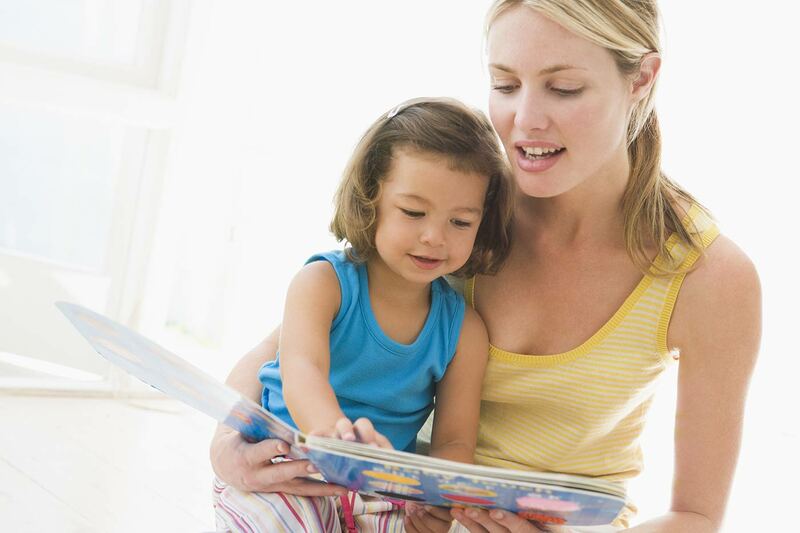 Get more tips on what to do when your 2 year old refuses to sleep. Parenting is a bit of a balancing act, don’t you think? On one hand, you don’t want to be so strict that you can’t let little things slide. But on the other, you also don’t want to let chaos rule and confuse your child even more. However, in the case of the 2 year old sleep regression, consistency in your schedule is key. Insisting that your child sleep in her bed one night only to let her sleep in yours the next will only confuse her more. As mentioned above, hold your ground and be consistent with not just the rules but your intentions as well. This also applies to your routine. While you can experiment with an early bedtime, try to stay consistent with everything else leading up to it, from bath time to books. The consistency will help transition your child into bed easier than without it. No doubt, the 2 year old sleep regression can catch any well-rested parent in surprise. Even a once-good sleeper could put up a fight overnight, whether over clear reasons or seemingly out of the blue. Still, you don’t have to simply wait it out and suffer months of sleep deprivation. The tactics start long before bedtime, from walking your child around her room to spending quality time during the day. An earlier bedtime ensures she’s not overtired, and doing her routine in her room makes the transition smoother. Offer a comfort item, whether a special toy or an item from you, to ease her fears and anxieties. And finally, hold your ground against the tantrums, staying consistent with your routine and how you respond. Struggling to get your toddler to sleep through the night? 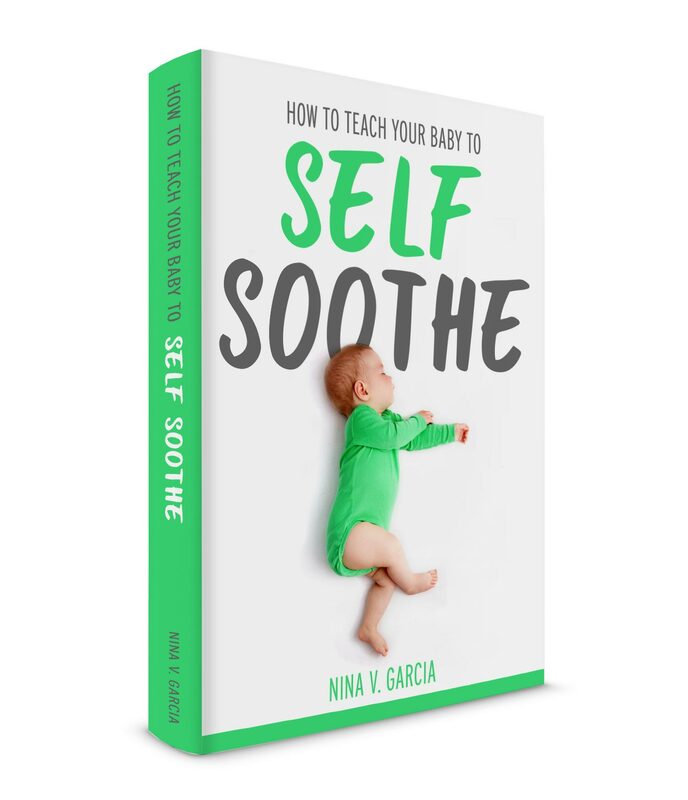 My guide, How to Teach Your Baby to Self Soothe (it works for toddlers, too! ), has given thousands of parents the sleep they need. Liked these tips on the 2 year old sleep regression? Pin this article on Pinterest! Thanks for this article! I will be trying these tips. My little guy wakes up screaming, “No!” And “Go away!” over and over. It stops when I’m in the room comforting him but when I leave he just starts ups again. He normally wakes up before 6 every morning anyways, and has refused to nap for almost a year. Now he’s waking earlier no matter what time I put him to bed. I am exhausted! It was not this hard with his older brother. I just have to remind myself this is a phase, and again – thank you for your article. These are awesome ideas! Inconsolably. He has a litttle cold so at first we gave in with more rocking and soothing and lying down with him to get him back to sleep. But now I’m not convinced it’s the cold as much as we’ve created an expectation that we’ll help him get back to sleep. My partner and I take turns doing checks, and ideally one of us can get him to settled enough to lie down awake and calm before we leave, but sometimes that’s not possible bc he’s too worked up or just keeps stalling. We’re ok with him crying it out a bit, but I’m wondering if there are any recommendation for a) how long we should stay in the room to check on him, and b) how long we should wait between checks (especially if he’s crying)? Hi Chrissy! I wouldn’t stay in the room for too long—no more than a minute. It’s really to check that all is okay and to reassure him that you’re still here. And as far as frequency, I’d check in starting out frequently, around 5 minutes, then increase the length of time to 10 minutes, then 15 minutes. Hello, thanks for your article. I’m having issues with my 2 1/2 year old. She was a great sleeper and all of a sudden she is so upset at bedtime she is throwing up. Nothing has changed & I am a stay at home mom so plenty of quality time. She has done well with the cry it out method but I can’t do that after she vomits. She will vomit at me even walking towards her door. Any suggestions? Hi Katelynn! It’s definitely rough when she reacts that way. I’d focus on calming her down and making sleep a positive part of her day. Try spending time in her room, don’t make bedtime feel like a punishment, maybe open the door a little with the light on so she doesn’t feel alone, etc. You can also show her ways to calm herself down, like holding a stuffed animal, singing quietly to herself, thinking of her favorite part of her day. Actually that’s one fantastic routine you can do every night, where right before tucking her in, you ask her what her favorite part of the day was, so that she’s off to bed with a happy thought in her mind. I hope that helps, Katelynn!